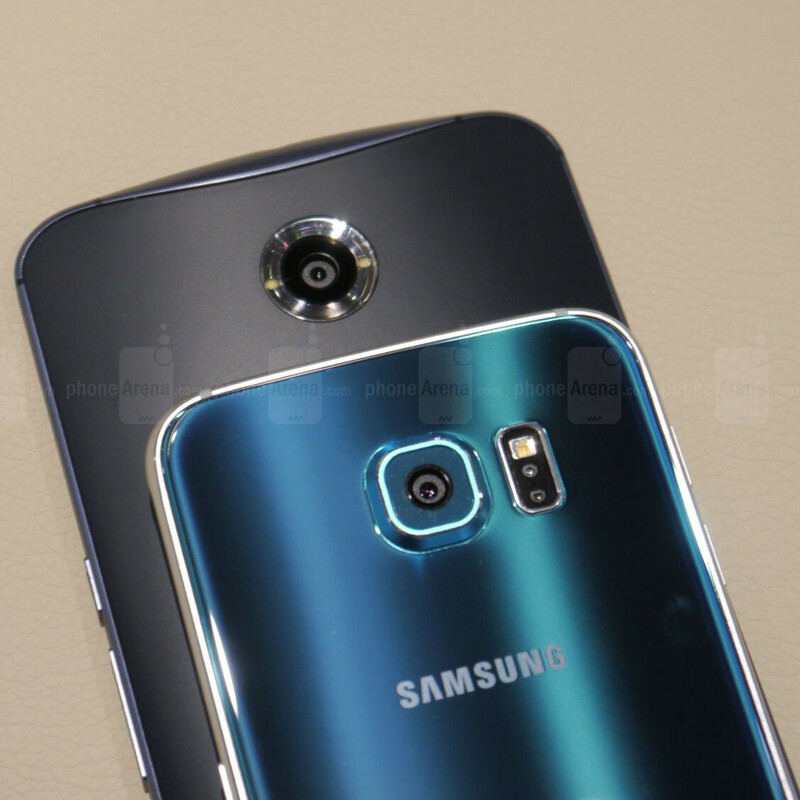 The metal and glass Galaxy S6 is undoubtedly one of the most exciting Samsung smartphones to come out in recent years. With a design language better catered to adhere to what today's consumers view as a premium, high-class look, and some cutting-edge hardware under its hood – we are definitely intrugues by this handset and how it compares to other recent flagships. So here's a comparison with none other than Google's own vanilla Android-toting Nexus 6 flagship! 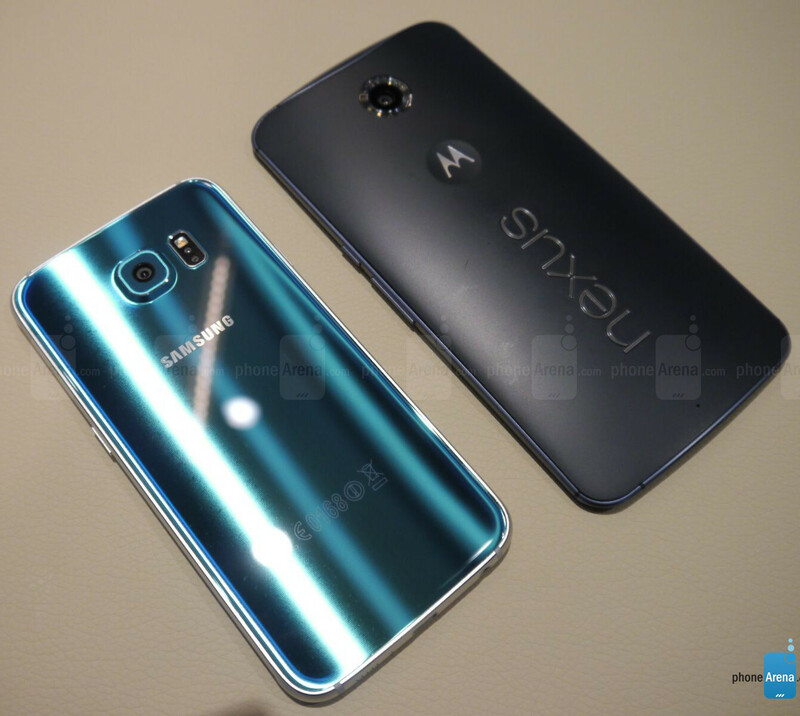 The Galaxy S6 truly outshines the competitor from the get-go here – the gargantuan Motorola Nexus 6 just looks rather dull with its plastic back, matte finish, and lack of accents or detail, while the S6 looks and feels nice and premium. Sporting a much smaller 5.1" display means that the latter is smaller, thinner, and lighter than the 6"-housing Google phablet. Both handsets employ AMOLED tech for their screens, and both exhibit fairly accurate color reproduction. The Nexus 6 wins in size, as it sports the giant 6" display, while the Galaxy S6 sticks to the more conventional 5.1" diagonal. Otherwise, both phones deliver a pretty crisp picture, as they rock a 1440 x 2560 resolution, resulting in 493 PPI on the Nexus 6 and 577 PPI on the Galaxy S6. The Nexus 6 has Qualcomm's last 32-bit warrior – the Snapdragon 805 – under its hood, whereas the Galaxy S6 is the first Samsung flagship to sport a 64-bit chip – a homemade octa-core solution, built on a 14 nm process. What this should mean is more performance for less energy, compared to the SoC in the Nexus. Samsung alsi employs a new UFS 2.0 technology for the flash storage in the Galaxy S6, which should make it 2.7 times faster than the currently used NAND flash. Additionally, the S6 sports 3GB of super-fast LPDDR4 RAM, allowing more room and speed for multitasking. The Nexus 6 is a Google flagship and, naturally, rocks a clean, unmodified version of the Android operating system. Not being bogged down by reskins and additional processes means that the UI reacts lightning fast to user input, leaving the feel of snappiness that few phones are able to achieve. Plus, it allows you to gawk at Google's Material Design in all its glory. Samsung, on the other hand, has its own TouchWiz reskin for the Android operating system, which has often been criticized for being too cluttered and too feature-packed, causing performance lags and user confusion. 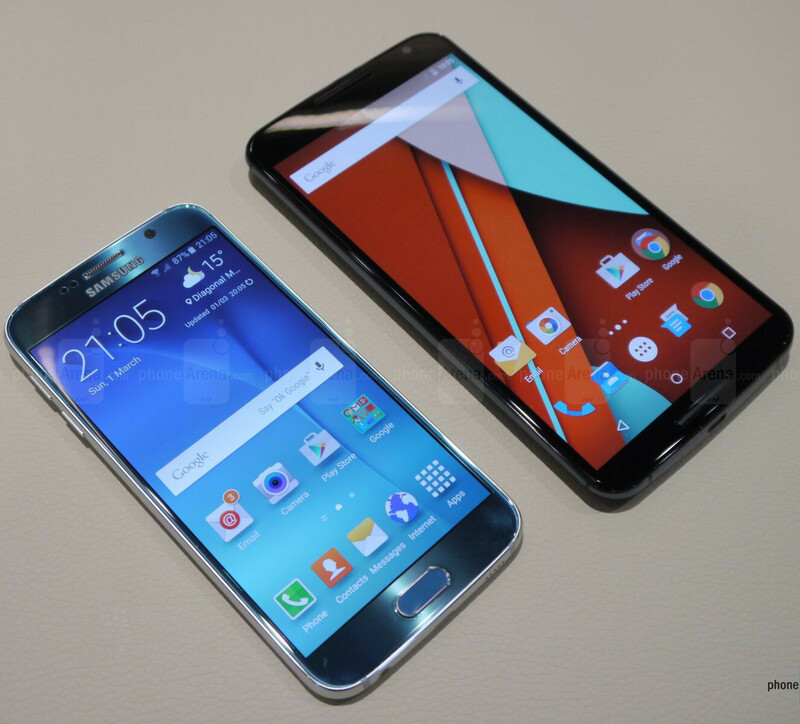 Well, the TW in the new Galaxy S6 flagships has been slimmed down and lightened, according to Samsung. We can definitely confirm that it looks cleaner, maybe feels snappier, but we've yet to put it through some extensive testing. The Nexus 6 sports a 13 MP camera with F2.0 aperture. It has OIS, HDR, 4k video recording – everything that we would expect from a modern flagship's snapper – and it performs quite well when pitted against the competition. The Galaxy S6 has a 16 MP sensor, which has a slightly wider F1.9 aperture, tracking auto-focus capabilities, and auto real-time HDR for both its snappers. We expect it to be at least slightly better than the Nexus 6, as the initial samples we took with the demo S6 on-site impressed with its contrast and depth of field capabilities, but we are yet to test the device extensively and draw our final conclusion. The Nexus 6 has enough room in its gargantuan chassis to fit a 3,220 mAh battery, which lasted for about 7 hours and 53 minutes on our battery life test – a good result for a modern device. Now, Motorola is a member of the Wireless Power Consortium, which naturally means that the Nexus 6 supports wireless charging via the Qi standard. The Galaxy S6 has a much smaller 2,550 mAh juicer, and we can't be sure how long it would last pushing the new QHD display – we only know that the new CPU is supposed to be an energy-saver, but can this be enough? Otherwise, one cool thing about Sammy's new flagship is the fact that it supports both the PMA and WPC standards, making it universal in terms of what wireless charging mat you will be using for it. The Galaxy S6 definitely feels like a superior device when pitted agains the Nexus 6, but considering all the next-gen hardware it packs – that's understandable. Of course, the new design materials are a definite win for Samsung, and we quite appreciate the fact that the company decided to go this way. The only thing left unresolved for now is how it would fare in terms of battery life and we can't wait to get a chance to test the S6 camera extensively in the near future. Nothing subtle about this year's Galaxy. It'll easily outshine its competitors (literally!). Nice to see how far Amoled tech has come since the technology used in Nexus 6. GJ, Sammy! 'same old touch wiz that will make the phone like a dual core running on ICS' - that shows how ignorant about this phone you are. No MicrSD is the only missing feature that is worrisome, rest all are fine. But if 64GB version is priced correctly I don't that would be a problem as well. No microSD and no removable battery so if anything happens to the battery you can't replace it... Or if it freezes up you have to wait for the battery to die. Also how do you switch out the Sim card if you can't open it up? Although I agree @GTR722 is way off base making stupid claims I have a Samsung Galaxy S3 SCH-i535 (dual core model) running Lollipop CM12 and it is SMOOTH so the whole "like running a dual core with ICS" is a laughably ignorant argument that just makes him sound stupid. The last phone i bought that wasn't black was the white Xperia S. Always appreciated black colors more, but i think i ll be ditching it with the Green S6 Edge, because it is dead gorgeous!! I didn't expect that color at all and when I saw it, I was positively surprised. It does look very classy in green. I heard that the green color of S6 was inspired by the color of world famous "Korean Celadon" from ancient Goryeo Dynasty. It is well known for its mysterious pale Blue-Green glaze. I don't know... It reminds me of the Nintendo 3ds aqua blue which was a glossy green-blue for that reason only the color doesn't appeal to me. But I can imagine they will have some other cool colors hopefully some vibrant ones. S6 the new fingerprint smudges king! Otherwise it's a great smartphone except for a useless performance/battery hindering 5.1" QHD screen... Even my humble Galaxy Alpha beats the crap out of it in GfX Bench onscreen benchmarks. Umm... No if the Galaxy s6 won against the Nexus 6 on the onscreen benchmarks the Galaxy Alpha doesn't come close. You should really pay attention to benchmarks more. If memory serves me correct, I remember all of the Samsung fans ranting about the protruding camera on the iphone 6...now here come the iphone 6 clone, Galaxy S6 with even a bigger bulging camera. I guess it's ok now that the next big thing is here. they also rant on the following: *aluminum body *non-removable batt *no expansion card Now that Samsung go with the trend, the bashers before are now gone and praise how perfect S6 is. How funny they are.